I came across this quote today on Facebook and just had to write about toxic people and how they affect you and me. I am very choosy about who I spend time with. For a long time, my dear cousin Kokka would say, I need to ease up a bit and be a bit more easy going with people even if they weren’t really nice. Well, I have never eased up on that. I only spend time with people who make me feel good, who increase my energy and are well wishers of mine. I am forced to spend time with some small hearted, not-well-wisher type of people as part of my social network and sometimes at work, but I am very conscious of it and make sure I reduce that time considerably. My logic is simple, anyone who makes me feel bad, is wasting my time and they do considerable damage to my well being. I don’t have the mental strength to not let them affect me, so I stay away. Here’s a blog I had written some months back on Toxic Employees. Do read it again. Organizations suffer when these toxic employees are not weeded out, they just eat away the organization from the inside. Toxic people are all over … On your social media, at parties, religious gatherings … Masquerading as friends. There is a program on the Zee Tamil channel called “Solvathellam unmai” which basically translates to “we speak the truth”. It’s a social initiative, where the anchor meets with people that are suffering due to illness, poverty or are unable to deal with some situations in their life and she helps resolve. Two days back, a girl came and spoke of how her mother had slow poisoned her father for 2 or 3 years and finally killed him along with her boyfriend. Her parents had been married for twenty years … This is the extreme end of toxicity, but there are many people around you who put you down every day, who say nasty things within earshot, who want to see you struggle – learn to keep these people away. If they are more powerful, just move out of that circle. Toxic people could be the reason for that nagging headache, the weight gain, the poor eyesight or any other physical injuries. I know of a dear friend who had been poisoned exactly like the above incident by her spouse, she has survived, but barely. Her career has nosedived and a vivacious, smart girl has become an under confident, undecided woman who is unable to hold a job. 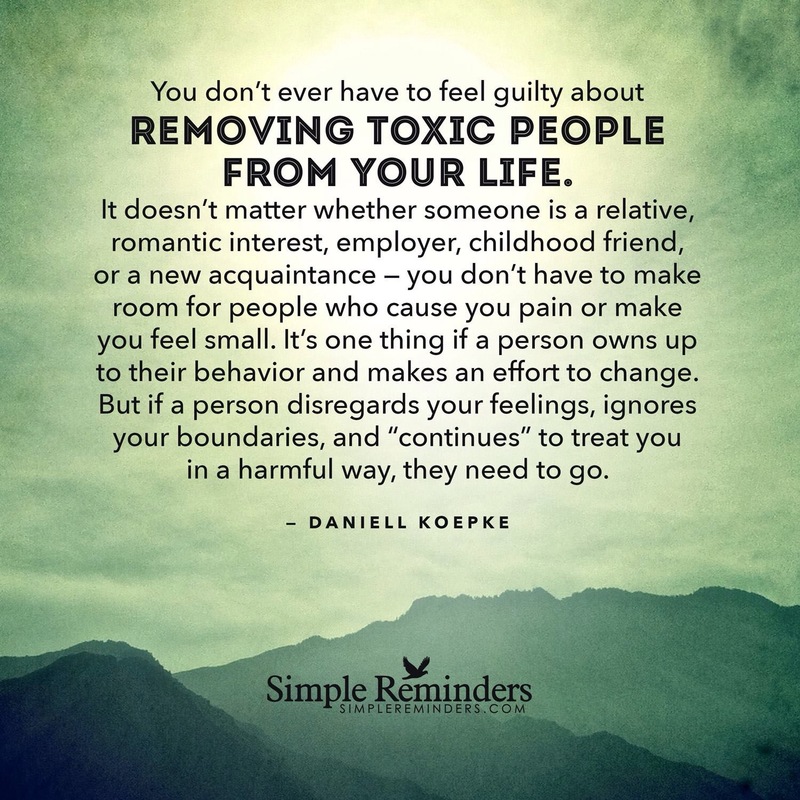 Toxic people can really hurt… Get away from them. Spend time only with people who make you feel good. Golden rule.